The adorable catchphrase offers you a spectacular wonder of the action movies of all times: “Your mission, should you choose to accept it…”. The sixth installment of the famous spy action series Mission: Impossible – Fallout is playing in theaters in Istanbul as of 27th of July 2018 after only two weeks of its world premiere in Paris. It would be pointless to go back to 1996 and start reviewing all the way from the initial Mission: Impossible that was adapted from a TV series by Brian de Palma. However, it is certainly noteworthy that the franchise was born to be a sparkling star of its kind from the very first and advanced itself on each “+1”. The brand-new picture welcomes the audience with a bad dream sequence at a safehouse in Belfast. The dream starts with Ethan Hunt (Tom Cruise) getting married to Julia Meade (Michelle Monaghan) after which yields to be a nightmare since this dreamy marriage turns out to be conducted by Solomon Lane (Sean Harris), the anarchist Syndicate criminal that Ethan imprisoned in Rogue Nation, the former of the series. Lane says to Ethan “you should have killed me” while an explosion is fading Ethan’s face off as he holds Julia. This tricky opening whispers gently what the theatergoers will be witnessing on the silver screen for about two and a half hours time..
Ethan, then, wakes up and receives his “mission” hidden under the cover page of the Odyssey by Homer for sure which has been concluded to lay another cue before the audience..
Actually, two years after Ethan’s capture of Lane, other Syndicate villains, so-called the Apostles, have continued their terrifying events including the release of a smallpox outbreak in Kashmir. The mission is to prevent the Apostles from having the plutonium for evil purposes. And here we go then!.. The next scene takes Ethan to a dark Berlin night with Benji Dunn (Simon Pegg) at the front and Luther Stickell (Ving Rhames) back in the van. They are so close to making a trade for the plutonium. However, when Luther is taken unexpectedly by one of the Apostles, Ethan has to make a quick decision either to choose one life right over there or millions of others’ for the future. He chooses Luther… In the meanwhile, the plutonium cores are completely stolen. Ethan meets Impossible Missions Forces (IMF) Secretary Alan Hunley (Alec Baldwin) to discuss on an alternative plan. The next plan accordingly is to meet the White Widow (Vanessa Kirby) in Paris at a party at the Grand Palais, to introduce himself as Lark and to get the plutonium. It is a great opportunity to have such a structure-minded script writer and director, Christopher McQuarrie for the recent Mission: Impossibles. There is not even one tiny unaddressed point in the scenario which is extremely exciting (and rare) nowadays!.. and keeping the integrity of the theme safely during the loading and unloading of passengers (as characters) and surprising pieces (as events). One of the major characteristics that differentiates it from the other spy action settings is that it does not depict a flawless and obsessively mission oriented motif. Indeed, all these characters have their own flaws which are actually their capabilities. This has also made the plot unique to create its own intensity and depth. Before telling about the cast, a respectful silence is what we all may need to talk about the incredible acting of Tom Cruise. Exclusively, he may be the most handsome man in the world & apparently at his twenties! However, apart from this physical advantage, he is Ethan Hunt, not more – not less! A perfectly performed Ethan Hunt, and doing all these stunts himself – leaping off rooftops, commands any vehicles including a helicopter, climbing up a rope attached to a helicopter and flying over thousands of feet, skydiving, signs the best running scene in a movie!… Unfortunately, he was reported with a broken ankle last August during filming which should conclude eventually that he deserves each and every compliment on his acting again and again!.. Keeping the cast from the previous series including Ilsa (Rebecca Ferguson) and other IMF team has also brought a good deal of familiarity and continuity to the flow. This surely has facilitated a conceptual coherence among the actors as well. Having all the cast concentrate on this emphatically real-time fifteen minutes countdown and pass it directly to the viewers is an obvious example to that!.. I liked the CGI devoided (to its best) cinematography (BAFTA awarded Rob Hardy). Especially, nothing could be thought better than a running ground level drone presented in 3D! It is also notable to acknowledge the camera operating for all the chasing through Paris streets, and surely another appreciation for the bathroom fight. The score (Lorne Balfe) is also well-balanced or served vis-á-vis details of the plot. I must add that my favorite soundtrack song will be the epic version of the original theme (Lalo Schifrin) at closing. The production companies Paramount Pictures, Skydance, Alibaba Pictures, and Bad Robot must be smiling gladly as well. 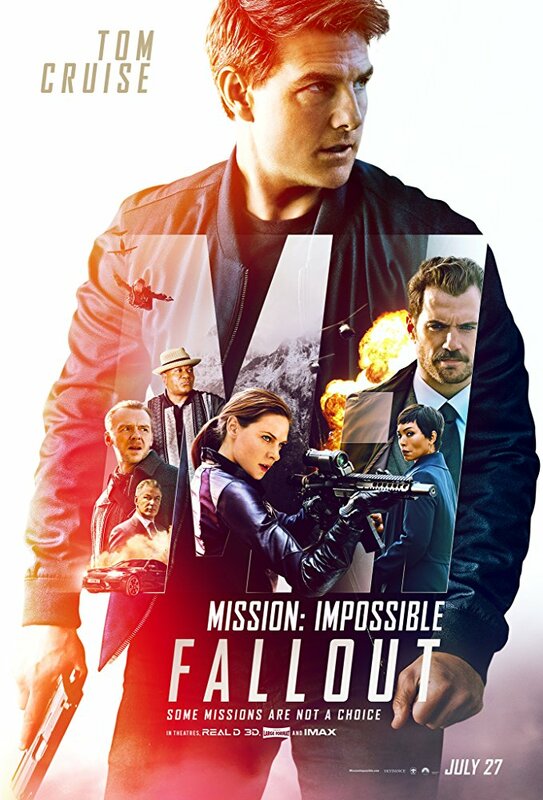 Because, within three days of the opening, Mission: Impossible – Fallout delivered the franchise’s highest-gross with $61.5 million via topping the weekend box office charts (US, Canada). A total worldwide gross of $153.5 million is reported just for now… It is now playing in 37 countries in RealD 3D, IMAX and my favorite IMAX3D. Mission: Impossible – Fallout is a very exciting and surprising action film with a high quality of technique embedded into a great flood including outstanding performances.